So, over the past five days or so I’ve been sick. Not that being sick was much fun, but it did allow me to be lazy, have Ben prepare all my [boring] meals, sleep, and read alot. One of my recent reads was Carol Cox’s Love in Disguise. I received this book through the blogger review program for Bethany House Publishers, a well-respected publisher of Christian fiction and other Christian titles. 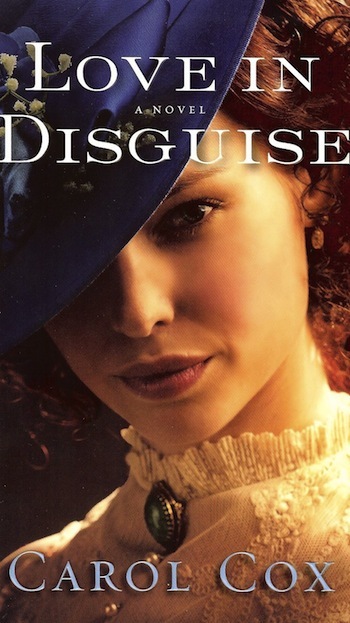 Jobless and down to her last dime, Ellie Moore hears about a position with the Pinkerton Detective Agency and believes it’s the perfect chance to put her acting skills and costumes to use. Disguised as both Lavinia Stewart, a middle-aged widow, and her dazzling niece Jessie Monroe, Ellie begins her investigation into the theft of silver from Arizona mines. When the thieves come after both characters, Ellie isn’t safe no matter which disguise she’s wearing. Should she give up and reveal her true identity? What will mine owner Steven do when he realizes the woman he’s falling in love with doesn’t really exist? As with my usual style… here’s my five point review! This was a totally unique storyline. I’ve read plenty of mysteries in my day, but never anything about an actress using her talents to pose as a detective–and play two characters in the Wild West at once! I’ve been an avid reader literally all my life and rarely read a completely new plotline. Score! I’m not usually a fan of the Wild West, mining, or books set in the late 1800s. I don’t know why, but that era just doesn’t appeal to me. But Carol Cox did a fantastic job blending historical drama with time-tested cares and concerns of life, love, and faith. This book was a delightful mix of romance, mystery, intrigue, and humor. All my favorite genres at once. My only complaint was that I didn’t really think it was possible to solve the mystery as the character does because the story is all from Ellie’s point of view… no additional information is given. I always like to try to figure it out first, but the solution came out of nowhere. Christianity wasn’t a huge part of the storyline, but Ellie’s growth as a person into maturity was attributed to a renewed relationship with God. This relationship [like it is for so many people–fictional or not] is hindered by childhood events, so the faith that was part of the book was realistic. In my eyes, that is much better than the cheesy tales where girl loves Jesus but wants a boy so prays for one and then falls in love with boy too and then grows in her relationship with God because He gives her a boy. Possible? Maybe. Realistic? Not so much. This story? Could happen. The author, Carol Cox, has such a great writing style. Relaxing, inviting, polished. I’ll definitely be checking out some of her other books, and hope you will too! Thanks to Bethany House for the chance to read this great book for free! Sorry about your sickness–but I’m glad it gave you some nice reading time! =) A good novel (read with a pile of pillow and blankets all around =) is a great way to recover. I’m sorry you were sick but I’m glad we got this book review! I’m always looking for new reading fodder. I just started Gone Girl last night (also just finished 50 shades…) So far the hype of Gone Girl has lived up! I just started reading The Working Poor, Invisible in America – so far, so good! i want to read that too. i’ve heard it’s good. veronica, this makes me so happy! i’d love to hear what you think when you’re done! and that’s so funny… “slow reading with my eyes.” i’m “slow reading with my ears” cause i get distracted. i can only listen to audio books when running, and even then, sometimes i realize i’m tuning it out and have no idea what is going on!